Sometimes, existing machines simply need to “do more” — to achieve greater productivity, higher levels of precision, better quality parts in less time. 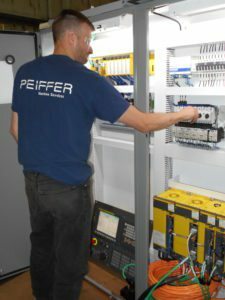 At far less than the purchase price of a new machine, a Peiffer CNC Control Retrofit provides a truly workable solution. Because we know machines, we can assure the right retrofit to achieve your specific goals. When it comes to retrofitting machine tools, “plug and play” is NOT the best answer. A thorough assessment of the functioning of your machine tool is necessary for the proper selection, installation, programming, and set up of any new control system. Put the Peiffer expertise to work on your retrofit project today! Did you know that Peiffer Machine Services is a FANUC Authorized CNC System Integrator? Not many companies have been honored with this designation, and we take this role very seriously. It means that we have been trained by FANUC, know how to specify the system components, build the panels, wire the controls, upload and test the programming. Troubleshooting and editing—no problem! AND, combine that specialized knowledge and skill with more than 60 years of machine tool rebuild experience, you can rest assured that your machine tool transformation is in the best hands. Trust us—we know it is serious business when you are replacing the ‘brains’ of the machine. Choosing the right control system to meet your needs and your budget is only part of the process. As part of a machine tool retrofit with a new FANUC CNC control, all other machine tool systems must also be examined to ensure their operating condition is ‘up to par’ and that they are integrated properly to maximize the capabilities of the new control.That’s where our rebuild experience makes the critical difference. So that when the project is complete, your machine tool—from top to bottom—will run better and do more than it did before. That’s integration and transformation in one project from one team. One call is all you need to make: reap the rewards of a CNC control retrofit with the Peiffer team— call us today! Peiffer Machine Services is an authorized dealer and installer of Heidenhain and Acu-Rite products for the machine tool industry, from a full line of DRO (Digital Read Out) systems to various encoders for use in linear, rotary, and angle machine tool applications. From our decades of experience helping to specify and install these devices for Peiffer customers, we can attest to value of this investment. Contact us today for more information on integrating a Heidenhain or Acu-Rite product for your machine.